This was a record breaking Women’s Championship both for live TV broadcasts and streaming audiences and for stadium crowds. England’s crowds at Doncaster (4,674) and Exeter (10,545) were a potent reminder that the women’s game should continue to do what is right for the women’s game. London is saturated with rugby and on test weekends at Twickenham, playing across the road at The Stoop has never really worked. The RFU took a punt in taking the game out of the capital twice and it paid off handsomely. Ireland also attracted record crowds this year with 6,047 piling into watch their game against France while even their badly timed match against England (more on the schedule below) drew almost 5,000. Italy are also now attracting crowds of more than 3,500. Outside of France, who have excelled in drawing crowds, these are figures for Ireland and England that were scarcely believable a few years ago as Katy Daley-Mclean reminded everyone when she noted that for her debut there were just 300 people in the crowd, mostly family and friends of the players. This success mustn’t go to waste. The women’s tournament still has no title sponsor, the teams themselves attract few standalone sponsors and the game has an opportunity to make household names of some of its young stars like Sarah Bern, Romane Menager and Jess Breach. Instead of resting on their laurels, everyone involved in running the tournament must seize the momentum and fast. There are pros and cons for playing under a model, which was designed originally for the men’s game. Yes there is great value in playing a competition under a Six Nations banner, which is known the world over, and the players love the prestige of being part of the same competition. But the women’s tournament is fast evolving and is moving in a direction that may one day allow it to stand on its own two feet financially – and that must surely be everyone’s aim. If it is to do so, it needs to explore changes to the way it is run. Competing with three men’s test matches, alongside three U20s men’s matches, for broadcast and media coverage across all five weekends, not to mind sponsorship interest, is difficult and no longer seems the right approach. If the women's tournament started one week later, or earlier, it would only overlap with the men's and U20s on two of the five weekends. And even with those clashes, some of the scheduling makes no sense at all. Why were the final two games on at the exact same time? Others have suggested moving the entire tournament to April or shifting games to Wednesday or Thursday night (surely impossible for amateur players) but this is a debate that must be had. On paper, given this was just England’s third title since 2012, the tournament is highly competitive with Ireland and France sharing a handful of titles in recent years. The reality is different however. The continued improvements in the English domestic game, driven largely by the RFU’s investment in the Tyrells Premiership, the professional status of England’s leading players and the long awaited separation of the England 7s and 15s programmes have handed this year’s title winners a triple-pronged advantage that is going to be extremely hard for France to match and almost impossible for everyone else, unless their own unions make serious about-turns in investment in their elite game. France, semi-professional and with a strong domestic competition of their own, are best placed but what of Ireland, Wales and Scotland, who were no match for England this year and who have nowhere near the resources – both in terms of players and money – to keep up? The factors that meant they just about hung on England’s coat tails in recent years have been removed. There are decisions to be made in these unions., where much of the focus has been on the grassroots game. If money isn’t spent on contracting or improving their already-elite players, there will be no realistic chance of any of them getting anywhere near a title – surely everyone’s aim. Ireland’s fall from World Cup semi-finalists and Six Nations winners, to fifth place finishers with just one win this year, has been scrutinised in a manner that will be most uncomfortable for the IRFU. If you have not watched former Irish players Lynne Cantwell, Fiona Steed and Jenny Murphy run over the ruins of this year’s campaign here you absolutely must. 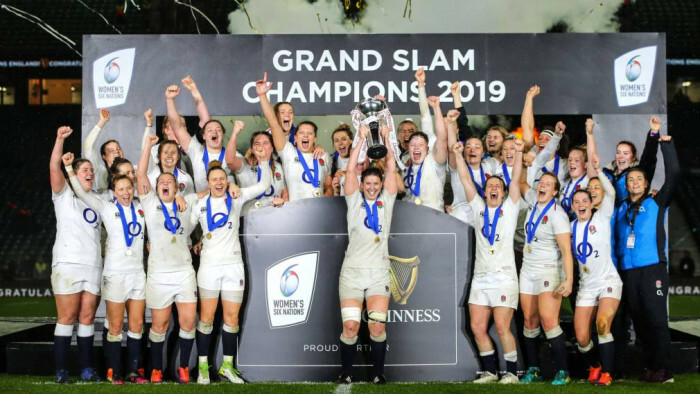 There was also coverage this week in the Times in the UK reminding people that despite winning a Grand Slam, England women received no bonuses whereas the men could have received a handsome bonus for the same achievement. On the Today programme, a few weeks ago I spoke about sponsorship and was asked why Wales, a successful rugby nation, invested so little in its national women’s team and in France the women’s games are played late in the evening often to maximise TV audiences as they have proved such a ratings hit. This is a world that those who are in charge of running women’s rugby are not used to. Pointing the finger at the IRFU and their shoddy handling of their national programme live on RTE may just force the union to listen in a way they have never before even had to pretend to. This is a welcome shift in the tone and coverage of the game which has shifted from non-existant, to occasionally profiled at major comeptitions, to proper scrutiny. As it shoud be. Last week, World Rugby issued a press release about the future of the controversial Nations Championship in the men’s game. In almost a throwaway line it said would also explore a “commitment to invest in a Women’s Nations Championship to accelerate the global competitiveness of the game"
There is whole other article in exploring what this might look like, but it is worth considering here given that outside of Europe, there is a near blank slate when it comes to women’s competitions. There is the Asian Championship - but that often has only 2/3 team in it - and the new Oceania Championship (3/4 teams) - and there has already been talk of bringing them together in some way. Elsewhere Rugby Afrique have made noises about setting up an African competition and there are suggestions of a three-team South American competition being planned. So there is potential for a thoughtfully designed women's series to encourage international XVs, giving everyone something to aim at on an annual basis, rather than once every four years with the World Cup. It could also possibly give an opportunity for the likes of Spain to be given the chance to play test rugby at a decent level that they are currently denied, if a spot was given to the European Champions instead of just giving it to Six Nations teams. Such a policy would also raise the profile of the European Championship, maybe tempting some teams like Scotland or Wales to take part again, as well as giving theoretical access to the Nations Championship to any nation in Europe, not just the Six Nations. This is a chance for the game to match the needs of the women's game rather that slavishly following men's designs and whatever route is taken, it means some long needed new test competition structure outside of the Six Nations.